To short a stock you are betting that the value of a stock will go down. Shorting stocks is the act of selling something that you do not own. In order to do this you have to borrow the shares of stock from your broker. Microsoft is trading at $30.00 a share. You think that the price is going to go down so you short 200 shares ($6000.00). You are borrowing shares of Microsoft from your broker at this high price of $30.00. Just as you expected Microsoft goes down to $20.00 a share. You decide that you are ready to cash in, so you buy (called covering) the shares at $20.00. Your broker will now return the borrowed shares to the owner and you will profit the difference. Since you shorted at $30.00 and covered at $20.00 your profit is $10.00 a share on 200 shares - $2000.00. You buy a new plasma TV for $4000.00 and invite me over to see it. You say that you have to leave for the day and that I can continue to watch it. While you are gone, I see a commercial for the exact TV that has just gone on sale for $3500.00 - at the same place that you bought it! So what do I do? I pack up your TV, grab your receipt, and take it to the store. I pretend that I am you and complain. The store manager gives me the difference between the price you paid and the sale price - $500.00. I return the TV to your house, pocket the $500.00, and you never knew what happened! It is the same thing with shorting stocks. From a traders perspective, all of this happens behind the scenes. You just simply log on to your account and click the sell (or short) button and you have just shorted the stock (your broker borrowed the shares from someone else). When you are ready to cover, you click the buy (or cover) button and your done. Pretty simple right? Not so fast. You must have a margin account to be able to short stocks. Your online broker may not have enough shares available for you to short. If the stock pays a dividend while you are short, YOU will be liable (you'll have to pay it). Some people claim that shorting stocks is un-ethical because they are contributing to the stock price going down. This is bogus! Remember that after you short a stock, you then have to buy it back! This creates buying pressure on the stock. 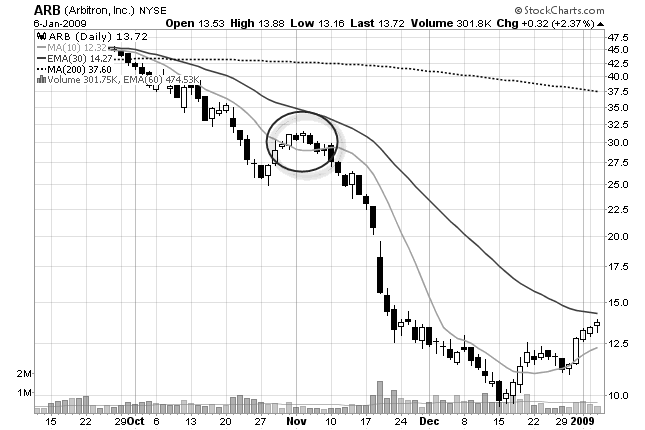 Short sellers slow the rapid decline of a stock by buying to cover on the way down. If the short sellers were not involved in the stock, it could plummet! Also, short sellers can be caught in a "short squeeze". This happens with a stock that has heavy short interest. Let's say that a lot of traders are short a particular stock. If the stock begins to rise rapidly, then short sellers will get nervous and want to buy (cover). This could add significant buying pressure to the stock, encourage new long positions, and make the stock explode! There is nothing wrong with shorting. It's just part of the everyday workings of the stock market. It is essential that a swing trader learn to short stocks. Buying stocks is only half of the equation! If the market in general is in a downtrend, you are not going to want to be buying stocks. So in order to make any money you need to learn the art of shorting. Learning to short stocks will also help you to better understand where reversals will take place. By shorting stocks yourself, you will be able to gauge where other traders are going to short stocks and cover their positions. Sometimes you can make money faster by shorting than by buying. Why? Because stocks typically go down at a faster rate, then when they go up! Fear is a much more powerful emotion than greed. The general public only plays the long side of the market. They do not realize that you can make money when stocks go down. They think that if a stock goes up, then this is "good". If a stock goes down, then this is "bad". Wrong! It depends on which side (long or short) of the market you are on. I think Wall Street really doesn't want the public to know about shorting stocks. In a bear market, the professionals on TV talk about how "horrible" the market is to encourage investors to sell. They are shorting stocks and profiting all the way down. When you short a stock, instead of waiting for a pullback, you are looking for a rally into the Traders Action Zone. You can see that the 10 period moving average is below the 30 period moving average. Also, the stock is trading below the 200 period moving average. This stock has rallied up into the TAZ and formed a swing point high which is part of our normal entry strategy. That is where you will want to sell short this stock. So you are really just trading the opposite of how you would trade long positions. That's it! Once you begin to short stocks, you will begin to get more comfortable with it. It won't make any difference to you whether we are in a bull market or a bear market. You can now make money regardless of direction!